Further below is an edited version of the statement collectively released by the 11 remaining Cop15 Prisoners. The first thing you can do is to support the people who still imprisoned by sending them emails, letters, drawings and packages. Emails can be sent to info[at]blackcross.dk or retsgruppe69[at]yahoo.dk. ABC goes to the prison with letters every day. Climate change is an extreme and ultimate expression of the violence of the capitalistic growth paradigm. People globally are increasingly showing the willingness of taking the power to rebel against that violence. We have seen that in Copenhagen, as well as we have seen that same violence. Hundreds of people have been arrested without any reason or clear evidence… even mild examples of civil disobedience have been considered as a serious threat to the social order”. In response we ask – Whose order do we threaten? Is it that order in which we do not own our bodies? The order well beyond the terms of any reasonable “social contract” that we would ever sign, where our bodies can be taken, managed, constrained and imprisoned without any serious evidence of crime. Is it that order in which the decision are more and more shielded from any social conflicts? Where the governance less and less belongs to people, not even through the parliament? As a matter of fact, non-democratic organisms like the WTO, the NB, the G-whatever rule beyond any control. We are forced to notice that the theatre of democracy is a broken one as soon as, one approaches the core of the power. That is why we reclaim the power to the people. We reclaim the power over our own lives. Above all, we reclaim the power to counter-pose the rationale of life and of the commons to the rationale of profit. It may have been declared illegal, but still we consider it fully legitimate. Since no real space is left in the broken theatre, we reclaimed our collective power – Actually we expected it – to speak about the climate and energy issues. Issues that, for us, involve critical nodes of global justice, survival of the human and energy independence. How the COP15 has ended proves that we were right. Many of us are paying what is mandatory for an obsessive, pervasive and total repression…We are detained with evidently absurd accusations about either violence that actually did not take place or conspiracies and organizing of law-breaking actions. We do not feel guilty for having shown, together with thousands, the reclamation of the independence of our lives from profit’s rule. If the laws oppose this, it was legitimate to peacefully – but still conflictually – break them. Luca Tornatore – from the Italien social centres network “see you in Copenhagen”. 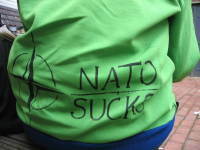 Am 17.11.2009 stand in Hersbruck bei Nürnberg eine Nato-Gegnerin vor Gericht. Ihr wird vorgeworfen, zum Nato-Gipfel im April dieses Jahres nach Straßbourg gefahren zu sein, obwohl sie ein Ausreiseverbot nach Frankreich erhalten haben soll. Im November 2008 hatte ihre Bezugsgruppe den Castortransport kurz nach der französischen Grenze für 13 Stunden gestoppt, indem sich drei AktivistInnen an die Gleise ketteten. 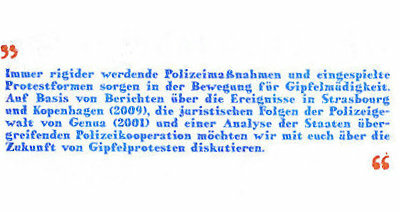 Daraufhin landete die Natogegnerin in der Polizeidatei für „linksmotivierte Gewaltäter(Innen)“, weshalb ihr während der Natoproteste verboten wurde, das Land zu verlassen, da es „dem Ansehen Deutschlands in der Welt erheblichen Schaden zufügen würde“. Der zweite Prozesstag wurde auf Dienstag, den 24.11.2009 um 13.00 Uhr gelegt. Treffpunkt ist um 12.00 Uhr vor dem Amtsgericht Hersbruck 1. Du browst gerade in den Weblog-Archiven nach der Kategorie 'Gipfel'.